Market volatility and the continued perception that the White House and lawmakers cannot or will not work together on the country’s economic challenges are currently considered by the highest percentage of affluent investors (15 percent each) to be the most serious threats to achieving their financial goals. Concern about the Political Climate increased from 13 percent in December when this question was last asked, and is likely to surge higher as the 2016 presidential campaign begins in earnest. The percentage is even higher among Millionaire investors (20 percent). This month saw a continuation of flashpoints between the President and the Republican-controlled Congress. Despite protests from the White House and Democrats, Republican leadership invited Israeli Prime Minister Benjamin Netanyahi to address a joint meeting of Congress, which frayed relations with one of the country’s closest partners and allies in the Middle East. Also this month, the Senate used the nomination of the President’s attorney general nominee Loretta Lynch as leverage to pass a now-controversial human trafficking bill that Democrats belatedly object to after discovering it contained an abortion provision. Immigration, health care, and continued ISIS terror attacks are other issues that remain unresolved. The percentage of affluent investors who consider Market conditions to be the most serious threat to achieving their current financial goals is down from 19 percent three months ago. While the Dow Jones industrial average once again topped 18,000 in March, the market also saw precipitous drops as high as 300 points. In the beginning of the month, a strong jobs report fueled speculation over when the Federal Reserve would raise interest rates, send the Dow tumbling. Volatility has continued throughout the month. On March 25, the Nasdaq Composite suffered its sharpest drop in almost one year. 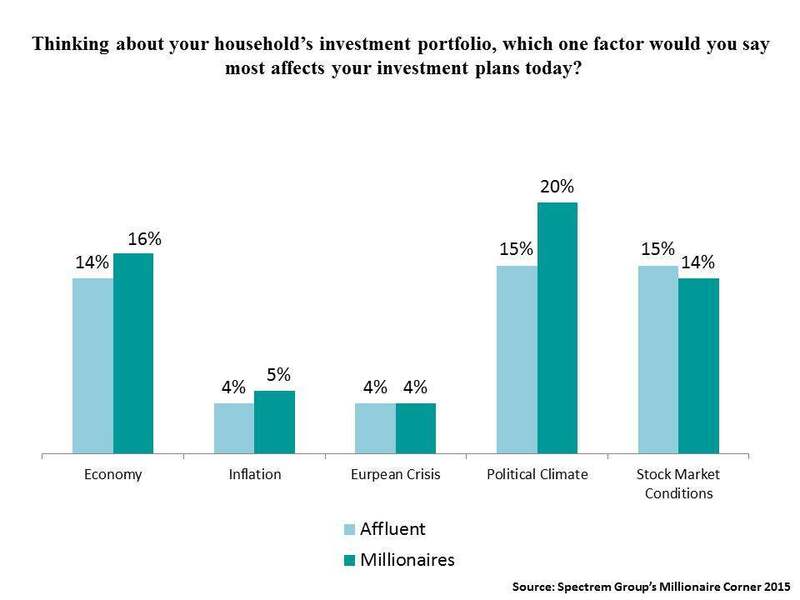 Along with Market Conditions and the Political Climate, a near-equal percentage of affluent households report they consider the Economy to be the most serious threat to achieving their financial goals. This has been spurred by less than encouraging economic reports released this month, including one that reported U.S. retail sales fell in February. Another reported that housing starts had fallen 17 percent last month. Both reports cited the severe weather as a primary factor.